C.M Recto Avenue is one of the main arteries of iconic Divi. Considered the major thoroughfare in Divisoria, C.M. 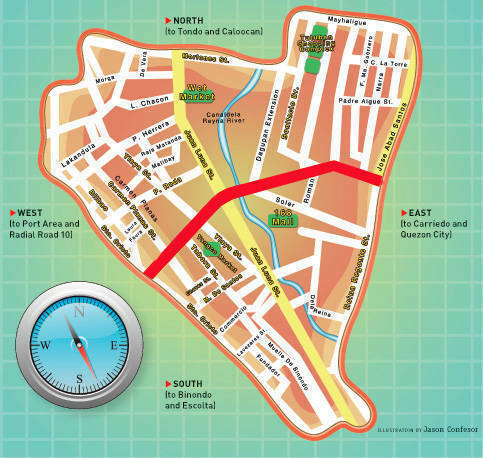 Recto Ave. bisects the district running from east to west to the port area of Manila Bay. Majority of the side streets of Divisoria branch out from this main road, making it a good starting point for shopping and looking for supplies. Major landmarks: Tutuban Complex main entrances of Tutuban Prime Block, Tutuban Centermall (behind Andres Bonifacio monument within a mini-park) and Tutuban Cluster building; Puregold Divisoria branch beside Tutuban; Benisons Shopping Center entrance just before the Canal dela Reyna estero. Goods in stores: Several generic drugstores just before Tutuban Complex; banks, RTWs and dry goods at Tutuban Prime Block ground floor, and various food stalls beside Cluster Building. Goods on the street: Closer to Juan Luna, lots of old stores selling clothes (mostly jeans and old stock), school uniforms (and cloth for them), plain and colored T-shirts, gowns (made-to-order and ready-made), and baby clothes and accessories. The rest of the stretch offers goods such as dried fish, fishing equipment, linoleum and tent material. Details worth noting: There is more variety inside Tutuban, but bulk of what is sold is RTW clothes. When you need a place to rest and eat after doing your rounds of shopping, you can stay at the Centermall’s spacious food court. You can also find the Robinsons Department Store and a number of established shops within Centermall. Dissecting Divi: Juan Luna St.